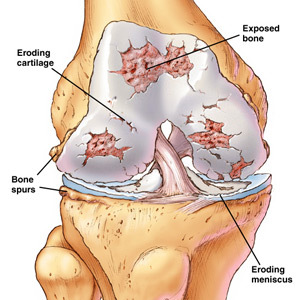 Knee arthritis, also referred to as osteoarthritis, is the wear and tear arthritis from degenerative joint disease – wearing and destroying the joint’s cartilage. It particularly occurs in patients who are over 50 years of age, but can occur earlier, especially with previous sports or traumatic injuries. Being overweight tends to exacerbate the symptoms of arthritis and weight loss can help with this. There also appears to be a genetic predisposition, and arthritis and knee pain tend to run in families. Previous trauma, such as meniscal tears, ligament damage or prior fractures, all predisposed to having knee arthritis and chronic knee pain. Often times, the knee may feel like it is going to give out and falling does occur. Other effective treatments include: Visco supplementation has been shown to be effective in certain patients and may prevent some patients from even having surgery. Visco supplementation helps by replacing the lubricating fluid (synovial fluid) in the joint, which dries out with the aging process and with arthritis. Joint supplements such as Glucosamine and Chondroitin Sulfate have been popular and have many components that can help replenish proteoglycan that is normally found in the joint, which may help improve the lubrication as well. An alternative treatment for osteoarthritis of the knee includes platelet rich plasma (PRP) and stem cell therapy. These two regenerative medicine therapies may help repair degenerative or worn cartilage, and may help with the healing process. Platelet-Rich Plasma (PRP) therapy captures the healing growth factors that are in a person’s own blood. By injecting the PRP into the damaged area of the knee, it may help regenerate cartilage and diminish pain. In addition, there are indications for platelet-rich plasma in healing a variety of conditions, in much the same way that stem cells may help regenerate different types of tissues. Adult stem cell therapy may be used to help regenerate knee cartilage, since it contains many of the healing growth factors that are also found in platelet-rich plasma. Platelet-rich plasma and stem cell therapy are innovative and cutting-edge treatment techniques that may help repair chronic or acutely damaged muscle, cartilage or joint problems. The most appropriate treatment technique for each particular patient should be discussed with your physician. If you continue to suffer with osteoarthritis of the knee and your current treatment plan leaves you wanting more options, perhaps a fresh set of experienced eyes can change your outlook. Since 1990, Dennis M. Lox, M.D has applied his personal interests in sports medicine, cutting-edge regenerative medicine and chronic pain management to helping patients increase their quality of life. Contact us for an appointment at 727-462-5582. Dennis M. Lox, MD, and the Florida Spine Center serve patients within the greater Tampa Bay area, including Clearwater, Tampa and St. Petersburg, as well as all of Florida and the US. All statements, information or opinions provided by this website are provided for educational purposes only. We do not diagnose nor treat through this website or by telephone. As you consider any treatment, discuss them with your physician. Regarding platelet-rich plasma or stem cell therapy: Neither statements nor treatments have been evaluated by the FDA. We do not claim that these treatments work for any listed or unlisted condition. Patient testimonials offer only the patient’s impression of how a therapy worked for them – individual results will vary; results are not guaranteed nor warrantied. As you consider any treatment, discuss them with your physician.